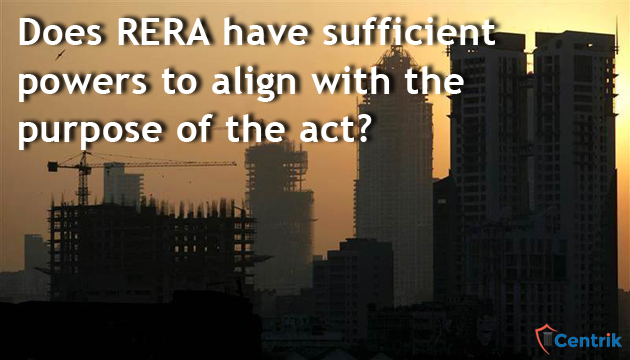 CentrikBlogsBusiness AdvisoryRERA ConsultingDoes RERA have sufficient powers to align with the purpose of the act? Since the implementation of the RERA Act, 2016, the RERA Authorities of the various States have passed some landmark Judgments as RERA law provides them sufficient powers for the smooth functioning of their duties and role. Having said that, the RERA Authorities are also of the opinion that few additions of powers should be given to make RERA Act more powerful. Lately, in a meeting held in New Delhi of Urban Development and Housing Department, the chairman of MP RERA said: “the RERA must be made more powerful for redressal of grievances of the complainants and to encourage the real estate sector”. Other states including Maharashtra also seconded the views of chairman of MP-RERA. The Chairman further added that the Authority must be empowered with rights and power, in order to take stern actions against any party who fails to abide by the RERA act, rules and regulation. In furtherance, he felt that the experiences of the authority must be taken into consideration while making an amendment in the RERA Act. He also stated that around 2583 cases have been filed with MP RERA and out which in 1435 cases the orders have been passed. Also, proper action has been taken against the projects which developed illegally and they have started a helpline number wherein one can inform about the illegal project developed in the State. The Chairman of MPRERA is also of the opinion that, the RERA Authorities should also be empowered in such a way so that they can also look into the quality of houses that being delivered to the allottee It is very notable that Madhya Pradesh alongside Maharashtra has been leading the country with respect to implementation of the RERA Act. At last, an outcome can be derived that, the RERA authorities across the country must be made and empowered with such rights and powers so that each authority can ensure proper implementation of the Act, orders and at every stage which will in a real sense protect the buyer and regulate the real estate sector.